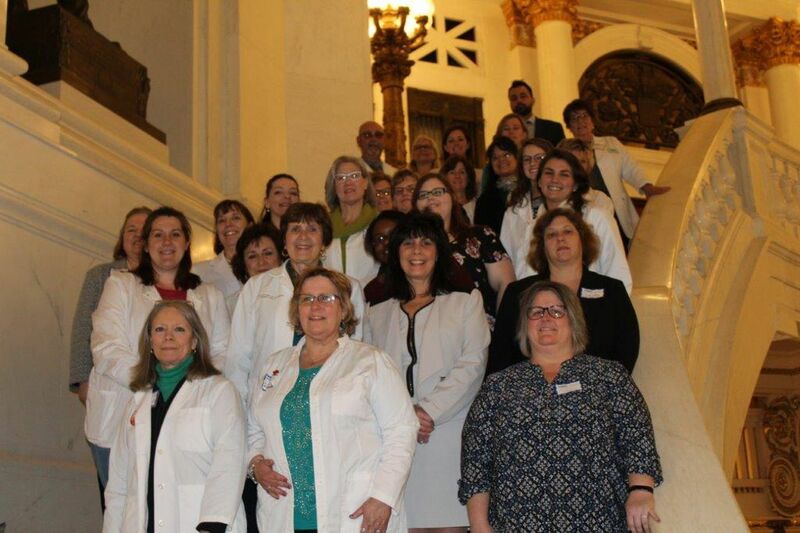 Members of the Pennsylvania State Nurses Association gather for their Legislative Day to discuss staffing rules that would keep nurses and patients safe. America continues to stare down a staffing problem when it comes to nurses. According to a nursing trends and salary report released last week, 53 percent of nursing managers saw an increase in open positions throughout 2017. Sixty percent had a hard time recruiting registered nurses. Things are better now than 20 years ago. In 2000, registered nurse and health-care economist Peter Buerhaus predicted a national shortage of nurses that would be at least four times larger than any prior shortage, if policies did not change. These predictions spurred private and public sector entities to create policy changes that would encourage younger people to explore the nursing profession. We are now seeing improvements in the size of the nursing workforce, with more young people signing up for the profession since 2002. That’s just in time for, according to Bureau of Labor Statistics projections, the number of jobs for registered nurses to spike from 2.7 million in 2014 to 3.2 million in 2024. But those numbers don’t tell the whole story. While the size of the workforce is growing overall, hospital nurses experience extreme burnout. A 2002 report found that job dissatisfaction among hospital nurses was four times greater than the average for all U.S. workers, and that one in five hospital nurses intended to leave their jobs within a year. And some parts of the country, especially southern and western states, still face a high shortfall. What’s the solution? Many health-care organizations have tried a variety of strategies, including sign-on bonuses, loan repayments, and overtime financial incentives. For most nurses, it is not about the money. It is about having their voices heard in their place of employment, where they should be given the hard-earned opportunity to weigh in on organizational policies and safer work environments. Newer nurses want experienced mentors and opportunities for career advancement. All nurses would choose to practice to the fullest extent of their licenses and education. If we are going to solve issues surrounding nurse staffing and safety, nurses must be invited to engage in these high-level discussions as together we create solutions to improve outcomes for patients and maintain nurses at the bedside. Input from nurses might have come up with a better solution than Massachusetts’ Question 1 initiative, which was rejected by voters in November. To tackle the problem of nurses being assigned too many patients, Question 1 proposed to set strict limits on the number of patients nurses can care for at once. Massachusetts Health and Hospital Association president Steve Walsh claimed the defeat was a victory “to continue providing the best possible care for patients throughout Massachusetts.” The Pennsylvania State Nurses Association (PSNA) does not support inflexible mandated nurse ratios, but we do believe change is essential. What Walsh and many hospital and health systems (HHS) fail to acknowledge is that serious staffing and safety challenges remain. The best way to address them is not to force nurses into strict patient limits, but to work together to create flexible staffing arrangements that give nurses the support they need without locking them into ratios. It’s time for HHS to act. The old adage “talk is cheap” seems to fit here. The solution begins with hospital administrators engaging staff nurses in discussions to address staffing and safety in the workplace. Nurses welcome the conversation. Betsy M. Snook is CEO of the Pennsylvania State Nurses Association.